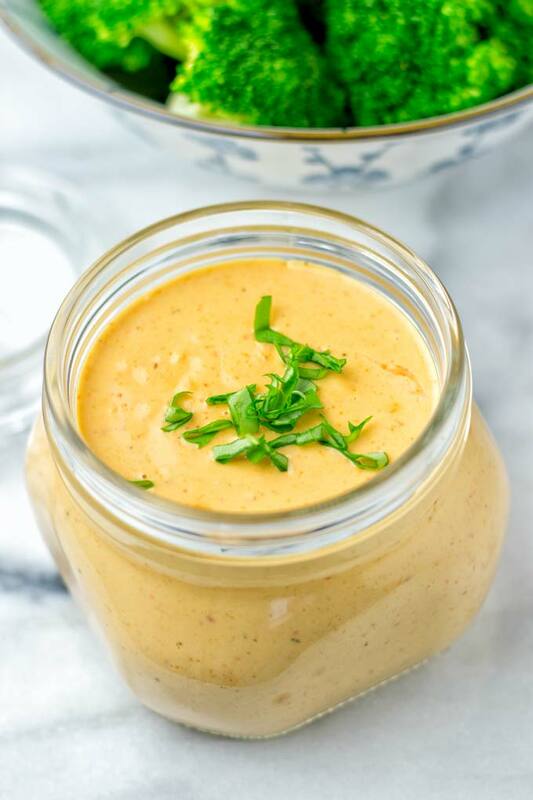 Trust me when I say you only need this Thai peanut sauce and won’t turn back to any other. My secret for real is the basil which makes the sauce irresistible. This gluten free recipe requires only 5 ingredients, not counting water, salt, and pepper. It’s perfect for all your quick dinner recipes that the whole family will love. 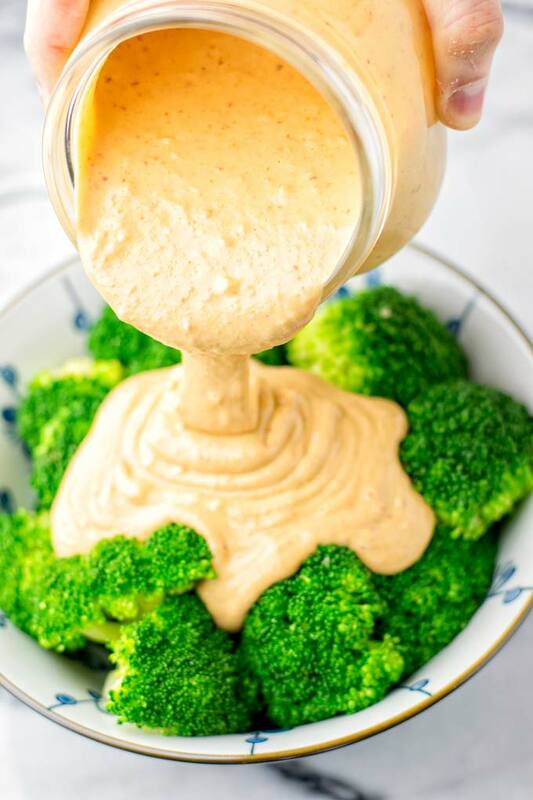 It’s creamy, oil free, kid friendly and absolutely suitable for any dinner ideas for kids . I’m addicted to peanut butter. I’m not telling you any secrets here. You can find me happily eating it from a jar with a spoon. If you’re are on board with me, look no further for easy peanut butter recipes. Try one of these healthy recipes like my Vegetable Panang Curry. Or if you have more of a sweet tooth, learn how to make brownies from scratch and check out my Vegan Buckeye Brownies. 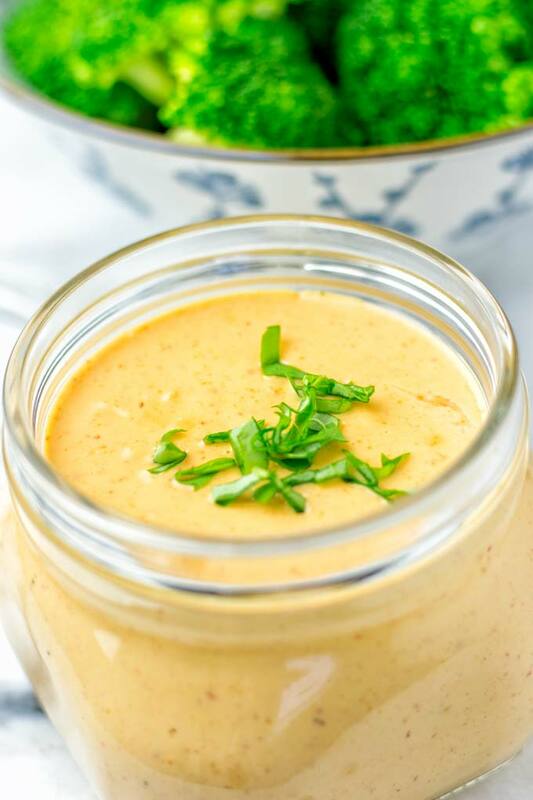 You can be sure this new 5 Minute Thai Peanut Sauce with Basil is: super easy, amazingly satisfying and creamy, perfectly flavored from the inside out, versatile, rich, and once you’ve tried it you won’t go back to any other peanut sauce. 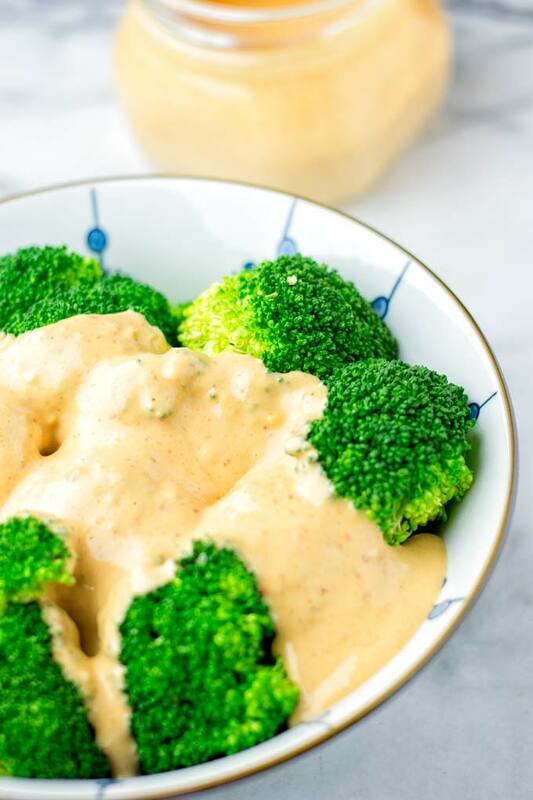 Pro tip: This sauce is also a super quick blender recipe. Alternatively to the above, combine all the ingredients except for the basil in the bowl of a blender. I strongly emphasize not to add the basil because otherwise you will get a green sauce. Process all until smooth and creamy. Now add half of the basil and use the pulse button. Use carefully 1 up 2 times until the basil is mixed. Last but not least you can use your immersion blender. Combine all the ingredients – again without the basil – and mix. Now add half of the basil and give it just a quick and short burst to mix it with the basil. Garnish with the rest basil on top. You can store the sauce in an airtight container with a sealed lid for around 5 days in the fridge. So it’s an amazing option for your meal prep ideas. Also it’s so good for any dinner, lunch ideas, work lunch, and so much more. If you have a slightly runny peanut butter or a nut butter which is made with additional oil, you will need to add less water than what I recommend in the recipe instructions. You will have to adjust the amount of water accordingly. Also if you’re making this recipe with homemade peanut butter, the texture might be different from my peanut butter, use less water if needed. 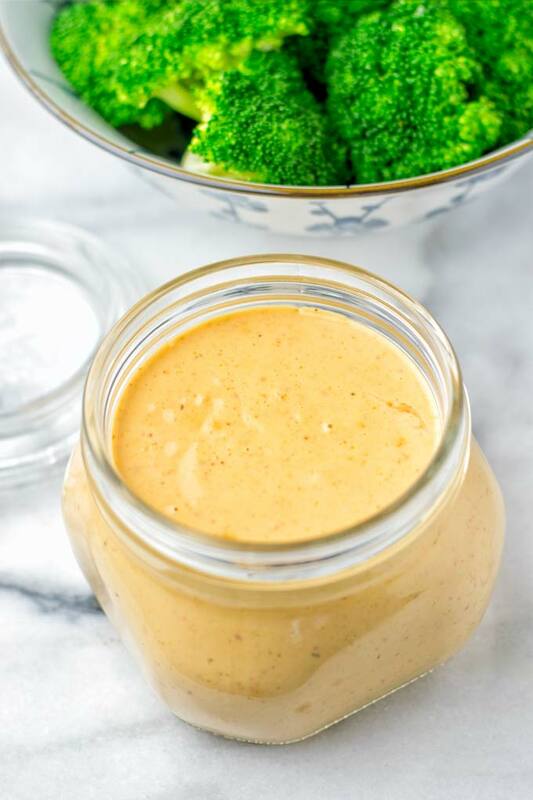 This easy peanut sauce is not only full with spicy Thai flavors which I find absolutely delicious. Pad Thai noodles, Thai peanut sauce noodles – just choose your favorite vegetables and pasta combine anything with Thai peanut sauce and make stir fry noodles. You are ready to go. 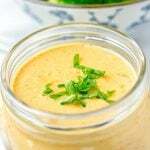 Use it as stir fry sauce and make a Thai peanut sauce stir fry. Absolutely fantastic for any stir fry vegetables. 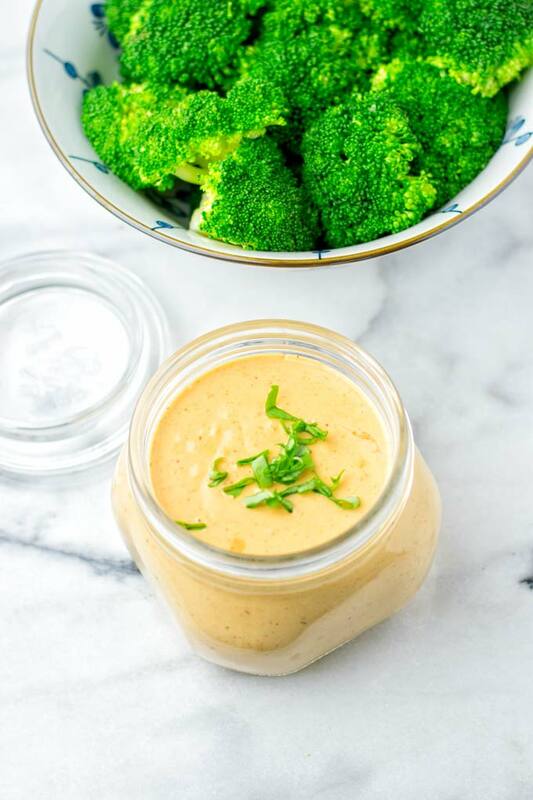 Just think about broccoli, cauliflower, carrots, peas and so many more options, yum. But I have to say that it really goes well in a broccoli recipe. 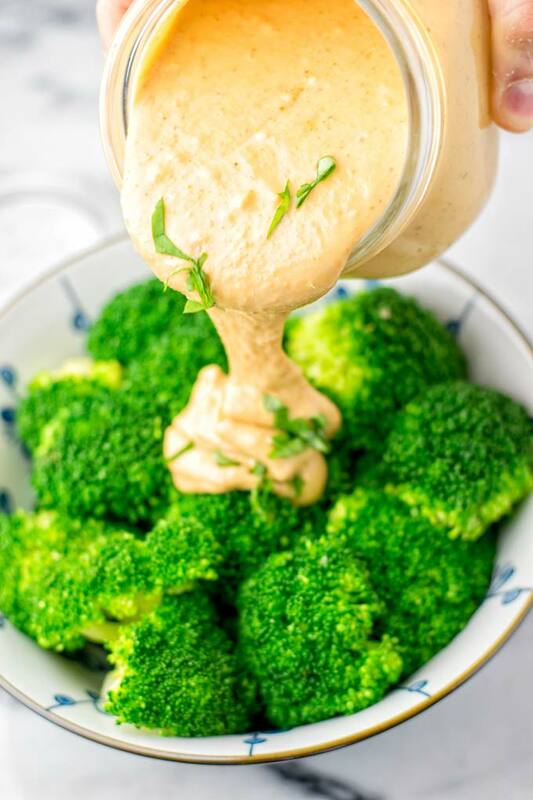 If you give this Thai Peanut Sauce a try, tag me on Instagram or Facebook with a picture and show off. Love seeing all your remakes and hear your feedback all the time. This sauce tastes amazing. First I used it on steamed broccoli and it was great. Then I added it to cooked broccoli, tempeh and ramen noodles and it was soooo good! My husband put it on non vegan food items and loved it, as well. I didn’t have fresh basil so I just added dried basil. Thanks a bunch for your fantastic feedback and sharing, Liz! I hope you’ll find lots of more recipes to try! what is red curry paste made of ??? or what can be a substitute???? Did you use Thai basil or Genovese basil? Hi Charlyn! I used Genovese basil! Has anyone used any other nut butter? Hi Argy! I would guess almond or cashew butter are delicious as well!